Well, not a book of birthdays but a book for a birthday. It’s my mum’s birthday and she asked a couple of months ago for me to make her a covered address book. I painted one for her when I was about 15, and she’s used up all the pages – most of the S page is filled with my many many house moves since I left home. So I have spent some time pondering a cover that would withstand another 16 years of knocking around the house without getting battered – embroidery was out, applique was out, I thought about trapunto which I love, but couldn’t work out a design. 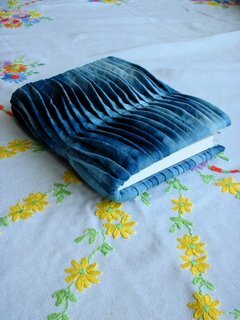 So it was pleated, using some indigo dyed cotton that I made a year or two ago. My mum already has the best piece of this framed on her wall, so this book matches. And she deserves many many lovely things as she is wonderful.